Have you ever had one of these thoughts about your ability? Do you sometimes feel at a disadvantage because other tennis players have much more talent than you? There is a big difference between talent and ability. Talent is an innate skill or capacity to perform a certain activity. Talent is present in a person at the time of birth. Ability is what you are ABLE to do. It may sound the same but there is a subtle difference. Ability is the power to accomplish something… it requires work. Talent does not necessarily lead to success. Alternately, there are countless stories of players who worked, against all odds, to achieve great success. Do you focus on others’ ranking, experience, or wins? Do you think other players are faster, stronger, or bigger than you? Why does this hurt your mental toughness? Making comparisons to other tennis players–who you think are better than you–only hurts your confidence because you put others on a pedestal above you! Top players don’t focus on other players and wish they had what others have…. Instead they focus on their own abilities and talents. They focus on their warm up and how to prepare mentally and physically for competition–not what others are doing. Top players know why they deserve to feel confident and they focus on these personal attributes. 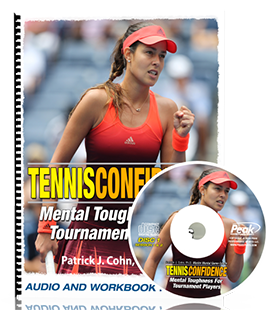 Learn Proven Strategies To Perform Your Best On The Court! Please Share Our Mental Game Tips! 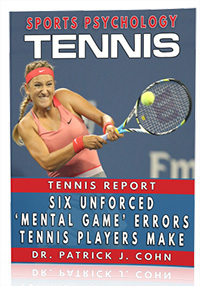 If you enjoy our mental game tips for tennis players and coaches, please forward this email to fellow players, teammates, or coaches who you think would appreciate it.